You are at:Home»What The World Eats»Hash House a Go-Go Is Worth the Stop! If there’s one thing that dominates American diets, it’s large dishes that challenge the stomachs of those who dare eat it all. The famous 72 ounce steak challenge has claimed many a victor [and victim! ], but the one challenge that not everyone has heard about is the amazing Chicken Benedict. Served by the San Diego-based Hash House a Go-Go, you can only pick up a genuine Chicken Benedict in Reno, Las Vegas, Orlando, Chicago, or Connecticut as well. If you’re not close to a Hash House a Go-Go, well… the trip to get to one is well worth the effort. This Is the Dish You’ll Always Want To Have! Eating Chicken Benedict is like having breakfast on steroids. It starts with homemade biscuits that make up the foundation of the dish. On top of the biscuits is an incredible garlic mash that is both rustic, yet sophisticated. On top of that you have some bacon. Some sage friend chicken with a touch of sweetness with corn flakes in the batter. You’ve got a chipotle cream sauce. There’s some salad tucked in there somewhere to get rid of some of your guilt. A sprig of rosemary and some toasted pasta juts out from the top of the dish to add some dramatics to the presentation. If you’ve ever imagined heaven on a plate, this really would be it. There’s Plenty More To Be Had At This Restaurant! Whether you’re in the mood for breakfast, lunch, or dinner, the portion sizes that you get at the Hash House a Go-Go are incredible. Imagine having enough food served to you that would fill up an NFL lineman – that’s what you get with every dish served here. Pancakes are the size of your head. When you order chicken and waffles, it’s like the waffles took steroids! If you’re into serious eating, you have to put this place on your bucket list. 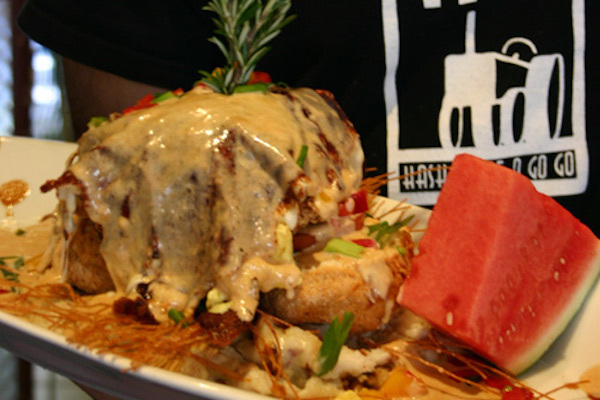 The reason why Hash House a Go-Go is such a popular place isn’t because of its portion sizes or reasonable prices. It’s because it is a chance to get some real farm-style, homemade food in an upscale setting. Would a single burger fill you up after a hard morning of working in the fields? Of course not! Some might see the giant portion sizes as being part of the classic American version of needing too much of something, but the reality is that Hash House a Go-Go is flashback to the homesteading traditions that built the U.S. to the nation it is today. One of the common ways you’ll see people enjoying this restaurant is to order one dish and then share it. After all – you basically get double portions! This makes visiting Hash House a Go-Go a budget-friendly proposition as well. With most dishes coming in for around $25 or less, add in a few bucks for drinks and a banana latte if you’re really brave and a family of four can get out for less than $60. If you love meatloaf, then grab the sky high meatloaf sandwich. If you love a good pork chop, you’ve got several amazing options including a grilled tenderloin with a honey mustard glaze with almonds. Maybe the best pot pie you’ve ever eaten in your life is awaiting you, topped with a cracker crust. Are you hungry yet? I know I am as I’m writing this! Many people want to visit the restaurants of famous chefs or ones that have been awarded multiple Michelin stars, but don’t count out Hash House a Go Go. It’s what the world eats, homestead style, but with an American twist.